Don't leave old electronics and boxes on the curb, the town of Cary says. 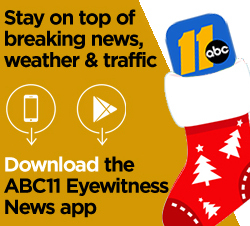 CARY (WTVD) -- What to do with all those empty boxes from those new electronics you got for Christmas? In Cary, police are asking you to take those, and any old electronics, to the Citizen's Convenience Center. According to officials, box TV sets should not be left curbside right after Christmas, because it tells thieves there's probably something new in your home to replace them. Police Lt. Greg Savage said the same goes for the packaging from new electronics. "I mean if somebody were to drive by and see a brand-new 70-inch screen TV box sitting out by the curb, it would make a criminal think 'Hey this may be an easy target for me. They just got a brand-new TV for Christmas,' so they'll want to break in and take it," Savage said. That's why the police department recommends taking any boxes that won't fit inside your recycling bin, to the Convenience Center. The Town of Cary charges $9 to process and recycle electronic waste, and won't pick up electronics curbside without a call-ahead. The Convenience Center is open every day this week, except New Year's Day, with extended holiday hours from 8 a.m. to 7 p.m. at 313 North Dixon Ave.